The Master’s level course will be taught by prestigious, international professionals such as Mariano Barbacid, Jose Fernandez Piqueras, Carlos Lopez Otin, Benilde Jiménez and Alberto Muñoz. It consists of a unique initiative in education, aimed at Associate’s and Bachelor’s Degree holders as well as PhDs in Biology, Pharmacy and Medicine, in addition to specialists who wish to gain a deeper understanding of the molecular basis of cancer. For that reason, we believe you will be interested in this 15-hour course we have created, which will last for two weeks. The online course will be hosted on our e-learning platform. Students will be able to take a test in order to earn an Academic Certificate from the Biosanitary Studies Center (CEB) that will be accredited by the Continued Training Commission of the Spanish Ministry of Health and Consumer Affairs in Madrid. In addition to the Master’s level lectures, you will also have the opportunity to schedule online office hours and tutoring with the administrators and professors of the course. 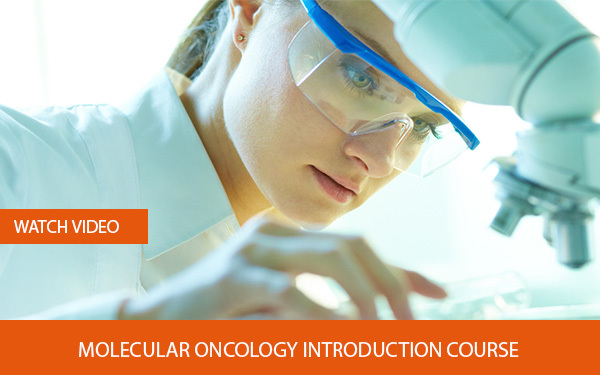 If after these two weeks of classes you wish to complete the Master’s in Molecular Oncology, you will receive credit for the material that was covered by this online course. The price for the Online Introductory Course in Molecular Oncology is 1,100 €. Please provide your Initials with your application in order for it to be evaluated by the staff. Do not miss the opportunity to learn from the best professionals and researchers in clinical oncology. Please do not hesitate to call us; our goal is to help you with your career. Learning Molecular Oncology from the best is the best investment for the future.